Yehey! 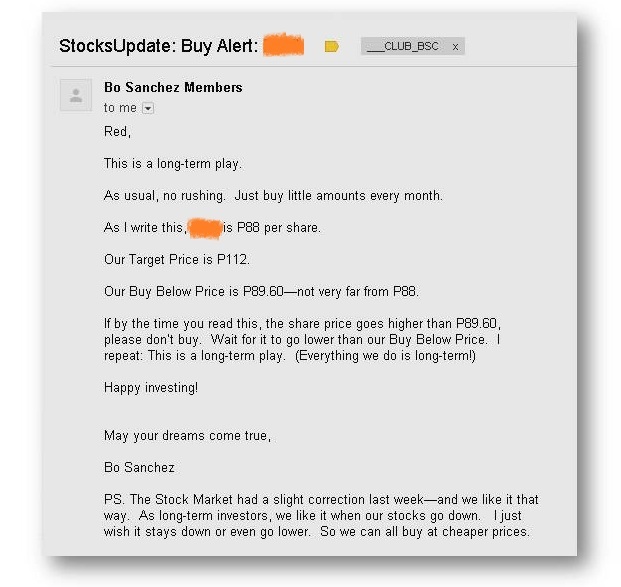 I received another Stocks Buy Alert from Truly Rich Club. This particular stock market update is so interesting. Notice this new-buy-recommendation below. The current price is P88, but the buy-below-price is only 89.60. Not very far from the current price, right? Meaning... we can only buy if the market maintain the lateral movement or if the price for this particular company goes down. I also remember this two golden lessons I got from the previous stocks update. You might as well follow and practice these two lessons too. Follow these! 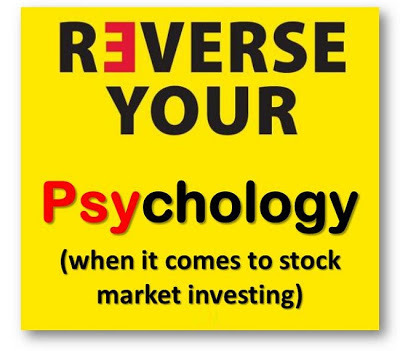 Reverse Your Psychology in terms of stocks investing. Lesson 1: When your stocks go up, be sad. Lesson 2: When your stocks go down, be happy. Bro. Bo Sachez also urges all members to avoid withdrawing and continue investing... "I urge you: Avoid withdrawing from your stock market investments. If you feel tempted, just remind yourself: “When I withdraw P50,000 today, I’m actually withdrawing P1Million tomorrow." This is a long-term play. As usual, no rushing. Just buy little amounts every month. As I write this, _____ is P88 per share. Our Target Price is P112. 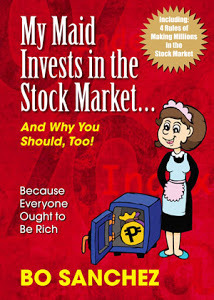 Our Buy Below Price is P89.60—not very far from P88. PS. The Stock Market had a slight correction last week—and we like it thatway. As long-term investors, we like it when our stocks go down. I justwish it stays down or even go lower. So we can all buy at cheaper prices. Below is the first page of this month Truly Rich Club stocks update. In this update. For this issue, Mike Viñas (a Corporate Accounts Officer and Relationship Manager at CitisecOnline) made some suggestions on How to Take Advantage of the Market, how to make it easier for us investors to participate in such a market. If You Withdraw P50,000 Today, You’re Withdrawing P1 Million TomorrowOh, I know it’s tempting. When the stock market is growing sweetly (like now), it’s sooooo tempting to withdraw “just a little bit” for that new ladies’ watch. Or a Hong Kong vacation. Or a birthday party in Boracay. As much as possible, DON’T. 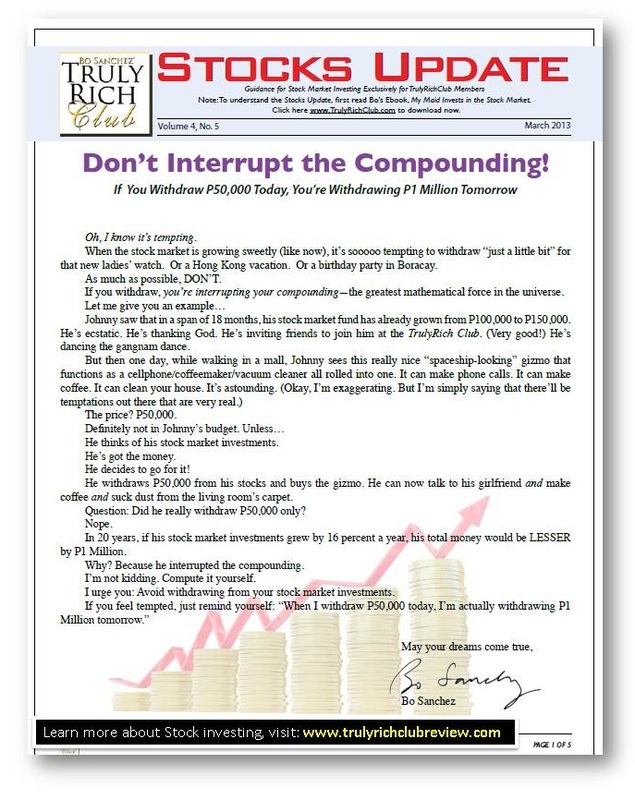 If you withdraw, you’re interrupting your compounding—the greatest mathematical force in the universe." "First, USE LONG-TERM MONEY. We expect to see a lot of volatility or sudden movements in price in the stock market. This is caused by the concerns regarding the relatively expensive prices of Philippine stocks as compared to stocks in other markets. Another driver of such volatility is the continuous threats from development overseas. Thus, as a protection, invest only the money that you will not need in the near term (tuition fee, medical bills, purchase of house, etc.). By doing this, you will not be forced to liquidate stocks at a loss assuming the market may undergo a correction during the time you need the funds. Therefore, simply select a comfortable amount that you can save and invest monthly or quarterly." To have complete access on the full Stock Update Report every month, Decide Now. Be part and become a member of the Truly Rich Club and enjoy a first hand benefits of being a subscriber. For more information about the Truly Rich Club, hit the get instant access button below.